Poor end to the group stages from Roger as he crashed and burned at the hands of Juan Martin Del Potro losing 7-6(3), 4-6, 6-3 in just over 2 hours. It was another poor match from Roger and he pretty much continued from where he left off against Ferrer; not serving that well, making too many errors and not really being able to dictate. The writing was on the wall from the start of this match to be honest, early errors, backhand not operating smoothly and the forehand isn't really factoring as a dominant shot this week. In fact I had to tweet during the match asking if he'd even hit any forehand winners. When do you ever have to ask something like that?? Roger had a couple of chances at 4-4 in the first to break but wasted them and the set ended up in a tie break and Roger didn't play it that well, his forehand went AWOL and Del Potro was soon leading 5-1 with 2 mini breaks. No real back there and he won it 7-3. The second set was a weird one, after winning the first set I thought Del Potro would be fired up but he went flat, that allowed Roger to break his serve early after a string of errors and 1 break turned out to be enough to level things up. To be fair it was a pretty good set from Roger, he won 20 of his 25 service points and made just eight unforced errors, they're good stats but Del Potro should have been far more pro active I thought. The crowd were flat too which probably didn't help. The third set was very poor, Fed netted two backhands en route to being broken in the first game and then never looked like getting back into it. He wasn't able to dominate any rallies, no venom on the ground strokes and Del Potro just coasted across the line without really being tested. Another win for him and that's 2 on the bounce now against Roger, very similar to the end of the 2009 season. Overall this match sucked if you're a Fed fan, Roger said himself that it's always better to win your final round robin match and I agree. I don't see how you go into the semi finals feeling confident on the back of a loss. You don't play another match when you have lost in any other tournament around the world so it must be a weird feeling, to know you have lost, yet you're in the semi finals tomorrow. Roger did the same in 2009 and lost his semi final to Davydenko of all people so I don't think this bodes well for him. Straight up I can safely say that Roger isn't defending his title in London. Some of you will say that's defeatist, I'm not keeping faith or I should be more be optimistic but that's not the case here; I'm just being realistic. I said that Roger wouldn't win Basel; he didn't. And I said after Basel that he won't win the World Tour Finals which he won't do either. His level isn't there, he's burnt out and he's lacking confidence right now. The season is over for him and he needs to go and relax over the Christmas period. After he plays some stupid Exhos. I had hope after how he played against Tipsarevic but it turns out that Tipsy is just the whipping boy of the group and he flattered Roger. Roger still played pretty well but since then his level has dropped off a cliff. I'm not sure who Roger is playing in the semi's yet, depends if he tops the group, most likely it will be Murray and I think Murray will be winning that one. Further increasing his H2H which is unfortunate. It very much looks like it will be a Murray vs. Djokovic final now. I think Djokovic is the favourite but we'll see. There's a slim chance Roger could make the final but regardless I don't see it ending well. I am feeling so bad that I have to agree with you! If Roger somehow win this WTF he should be awarded with a big statue in London! I have just one question! WHY, the hell, wasn’t he attacking on Delpo’s forhend after 4-5 inside-out on Delpo’s backhand? I do not like Murray as a player, and even less when Roger wins…but I hope the best is still come! Bad match and Federer knows he isn’t up to battle Mugly and/ or djerkoff. Oh Well, the guy needs a break. I fear you are right Jonathon, Fed hasn’t been firing on all cylinders lately. I always feel so depressed when he loses. But he still is the greatest and has a great game, he really does need to rest and regroup for the new year.He has played a lot of tennis this year and deserves a rejuvenating break. To win the World Tour Finals three years in a row would be just incredible at 31 years old and with all he has already accomplished this year. I am going to try to go into the semifinal with that attitude so that even if he loses I won’t be devastated. The disappointing part if he loses is that it will be last time we see him again for a long time! I’m not too worried, but I never am. He only hit three more UE than in the match vs Ferrer, and he played very well in the third set. 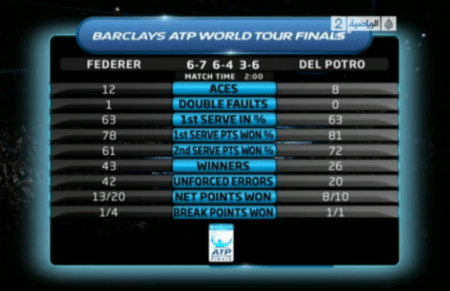 Besides, Delpo was playing very well in that final set. You know, whenever Fed loses it can be as a result of the opponent’s play. Delpo’s serve is very tough for Roger to return because it’s so heavy. And in 2009, against Davydenko, he was two points away from winning that match. I do think Delpo is harder for Fed match-up wise than against Andy or Nole. Sorry, Fed played well in the second set. I agree, I would take a miracle for a tourney win! Mark my words: the Berdych loss is what caused this! Yeah, most will disagree. But I believe it was a major mental blow for Fed; he really doesn’t have the self-belief he had during Wimbledon! Roger, take a rest and aim for a record 5 in Aussi! We will always support you! C’mon Jonathan, have a little faith, just a little please? I’m agree with your all analysis, but this old man is a tennis genius. He can play like sh*T in one game and play magnificent in the next game. If it would be Djoker Murray final, it’s oke, but as a fan, I still keep a little faith the he might bring his A game in semifinal. But we’ll see… (I kind a more agree with Ruan’s latest post on Roger’s chance in semifinal). I kind a put it in my perspective this way. Look, this man is 31 years old. If Murray or Djokovic or even Delpo face him, they should have win. Come on, they are not even 26 years old, and at their prime time also. So if they lose to Roger, they should be ashamed, beaten by 31 years old with two kids. So, if someone who never watch tennis but understand the effect of age in sports ask, who plays? It 31 years old Roger vs 24-25 years old Murray-Del Po-Djoker. Wow, 31 years old. He should be retired already. Ashamed on the younger ones to even lost a set. For Roger fans, just enjoy the game. Even when he lost, he always cheer us from time to time with genius shots and jaw dropping moments. It’s normal that he lose, it’s only the genius inside him that prevail when he win. Go Roger! Even if he reaches the final, I don’t think he can win. Djokovic or Del Potro will be even TOUGHER to beat than Murray. NEW LOOOK IS GREAT!!!!!!!!!!!!! BRAVO JONATHAN! Haha thanks! Still a few bugs to iron out but can’t be missing Feds matches! Wow, what an amazing match by Federer! The man is GOOD! I know, the undisputed GOAT! Love the new site layout by the way! Cheers man, I was just ask if you got my email, but I can see by the picture you did, cool pic!